During the month of November, we scaled Ivory Ella past past one million in sales in one month of advertising. The following case study walks you through step-by-step how we made this happen. Our process of scaling a client focuses around "new-customer acquisition.” We prospect for new customers by leveraging data built from retargeting. In order to find new customers, we looked at information from their current customer lists and built a customer profile. With that, we were able to scale into bigger audiences with "Interests" on Facebook. Those interests were heavily focused around charitable foundations as well as animal activism. We looked for associations, other brands, charity foundations, as well as animal activist websites and pages to set up our dynamic campaign of new product launches. We dispersed the tailored ads across a variety of the results as to optimize the ad interaction, and gain the ability to heavily retarget. The quality of an ad’s images is the key to determining it’s success. Low quality or poorly designed images can skew the test of whether the viewer is going to positively react to a product or not. Any existing data that you may have is of critical importance in being able to scale up a campaign. In Ivory Ella's case, they had tens of thousands of purchase data to leverage into custom audiences and lookalike audiences that could be split into a myriad of usable data. MediaMaven uses this existing data to create unique audiences with our exclusive in-house software. For instance, if you were to run out of a size LARGE, your ad performance begins to drop. In Ivory Ella’s case, we were able to extrapolate the people who had purchased other sizes and build unique campaigns to target the buyers of the other sizes while the LARGE size was out of stock. Building audiences of buyers who added 2 unique items to their cart, frequently bundled, or other trending items is effortless for MediaMaven, and are a few of the ways we leveraged the data with Ivory Ella. With Ivory Ella, we built them a unique system that allowed them to scale their front end ads as well as Their back end remarketing. Creating a Top of Funnel, Middle of Funnel, and End of Funnel System with custom data and lookalike audiences allows you to scale and track customer flow and sales. With Ivory Ella, we focused a large portion of our efforts on the front end. This allowed us to create numerous lookalikes that kept the front end of the funnel saturated with potential customers. Doing so allowed MediaMaven to create a more profitable Middle of Funnel and End of Funnel remarketing ads that increased sales overtime. 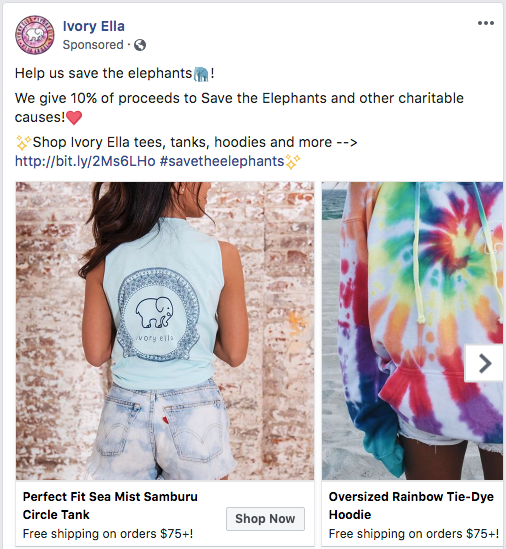 In order to scale Ivory Ella to over $1 million in sales in a single month, we took the approach of launching every ad in a sequence of events that guided the audience to the End of Funnel. Launching on specific dates, monitoring, and scaling these ads was a process of risk mitigation and leaning on Facebook's "Learning Mode" with every adset and campaign. By focusing on and learning from Facebook's algorithm, MediaMaven was able to drive massive sales results for Ivory Ella.